‘The only true history of a country’, wrote Thomas Macaulay, ‘is to be found in its newspapers.’ Yet, in the past, scholars of imperial history and of the media worked in essentially compartmentalised spheres. With a few notable exceptions, such as the propaganda studies associated with the First World War,1 the overwhelming tendency of historians has been to utilise the media — the press in particular — in an illustrative fashion, neglecting to give due deference to understanding the media forms themselves or acknowledging their function and impact within the imperial context. It was seen as easy copy and used and often abused — as such. 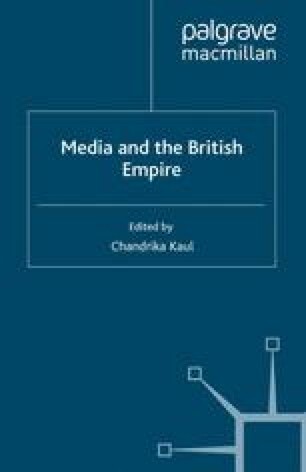 However, the connections between media and the British Empire have attracted rapidly growing scholarly interest in recent years, engaging the attention not merely of historians, but of students of media, literary culture and politics. It is an interest to which the quality and variety of contributions in this collection bear testimony.